On the outside looking in at the playoff race just a few short weeks ago, the Chicago Blackhawks have sprung to life recently, putting themselves in a postion to enjoy their stint as defending Stanley Cup champions past the end of the regular season. The Blackhawks are winners of six straight, with the last four coming against teams that are either in the playoffs (Phoenix and Calgary) or just on the cusp (Nashville and Minnesota). During their recent hot-stretch, the Blackhawks have leapfrogged several teams to currently claim the fourth spot in the Western Conference with 76 points. Behind the inspired play of team captain Jonathan Toews and the stellar goaltending of Corey Crawford, the Blackhawks finally seem to be getting over the roster changes made to the team following their Cup win last year and are positioning themselves for another strong run. The Islanders' Kyle Okposo has battled through injury this season but has recently returned to the Islanders lineup, ready to help his team finish the season strong. On Wednesday night against the Minnesota Wild, the young winger scored one of the more unique goals of the season, on a play that is rare to say the least. With the Islanders controlling the puck in the Minnesota zone, Okposo set up shop in front of Wild goalie Niklas Backstrom. Islanders teammate Michael Grabner worked his way away from the boards with the puck, and fired a shot on goal once he reached the slot. Minnesota's Greg Zanon got a piece of the shot however, which trickled towards Okposo, who was battling with Marek Zidlicky in front of the net. When the puck reached Okposo, he swatted at it with his stick, putting a blind between-his-legs backhander by Backstrom, in what what turn out to be the gamer-winner. In a 5-3 win over the Phoenix Coyotes last Friday night, rookie Matt Calvert of the Columbus Blue Jackets had a game that he will never forget. Calvert set up R.J Umberger late in the first period for Columbus' first goal of the night, getting the Blue Jackets on the board and cutting into Phoenix's 2-0 lead at the time. Columbus would tie the game late in the first on a Jakub Voracek goal, and then Calvert would lead the team home. Starting at the 2:37 mark of the second period, Calvert scored three straight, unanswered goals, giving him a natural hat-trick, the first in his young career. The 21-year old from Brandon, Manitoba beat Ilya Bryzgalov for all three goals, an extra wrinkle to the feat considering Bryzgalov was one of the finalists for last year's Vezina Trophy and having another fine season again in 2010-11. 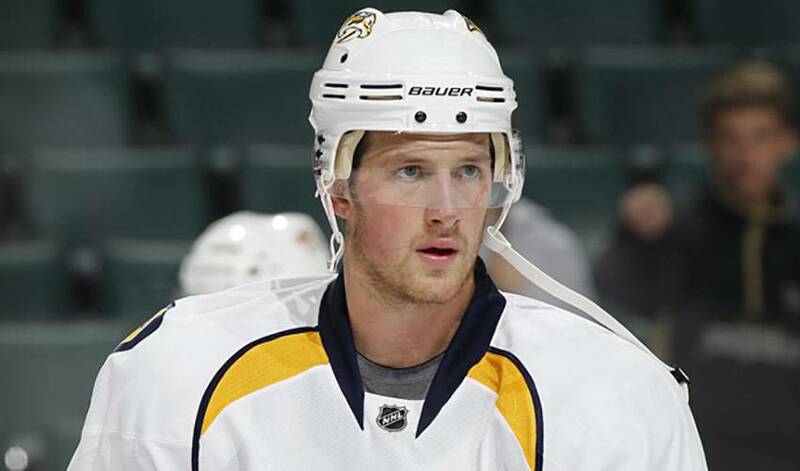 On Tuesday night in Edmonton, Nashville Predators rookie centreman, Blake Geoffrion enjoyed two amazing thrills in his young NHL career. The first was scoring his first career goal off of an amazing individual effort by teammate Ryan Suter. After Suter carried the puck in the Oilers zone on a wide rush, he made a centering pass to Matt Halischuk as his momentum carried him behind the Edmonton net. Halischuk one-timed the puck, but missed the net. The puck rebounded perfectly to Suter, who made a blind, behind the back pass to Geoffrion, who was wide-open by the net. Geoffrion, wearing the #5 of his famous grandfather “Boom-Boom”, stuffed the puck past Edmonton's Martin Gerber, registering what will most likely be the first goal of many. The second and potentially even more impressive stat, is that with his inclusion in the lineup, Blake and his family became the first 4-generation of players to suit up in the NHL, going all the way back to his great-grandfather, Howie Morenz! Congratulations Blake, from NHLPA.com, on this fantastic accomplishment! “You'd swear I dropped an anvil on his toes. His mouth dropped, his eyes got big and he went as white as a ghost.”- Columbus assistant coach Bob Boughner, describing Matt Calvert after Boughner jokingly told him that he had accidently thrown Calvert's hat-trick puck into the crowd following the game.